The IceBox became a house of horrors once again for the Lincoln Stars as they dropped two disappointing games this past weekend to fall further in the USHL western conference standings. 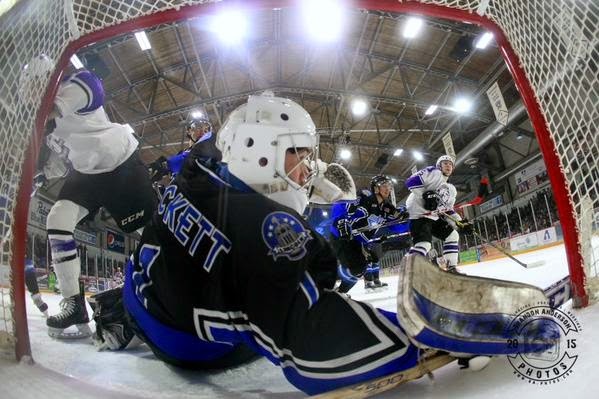 On Friday, the Stars lost 3-1 to Tri-City, and on Saturday they lost 5-2 to Bloomington. With the two regulation losses, and Waterloo's three points earned this weekend, the Stars are now all alone in last place in the USHL western conference with a record of 13-21-5 (31 points). Lincoln's winning percentage of .397% is last in the entire USHL. The Stars are 14 points out of a playoff spot in the USHL western conference with 21 games remaining in the regular season. Click here to view the current league standings. Well, I'm not sure where to even start with these two games. If the playoffs weren't out of the picture before this weekend, they certainly are now. It's the same broken record game in, and game out. Inconsistent play. Defensemen can't get the puck out of their own zone. Turnovers, turnovers, and more turnovers. Stars goaltenders standing on their heads in order to keep games somewhat close. No sense of urgency in long stretches. No adjustments made during the game to fix above problems. It's just ugly hockey, folks. A colossal second period collapse was all that the Tri-City Storm needed to skate to their ninth straight win and a 3-1 victory over the Stars Friday night at the IceBox. This was a very strange game. Lincoln came out extremely strong in the first period and dominated play for the first 8-10 minutes. I was really happy with what I saw. Lincoln's forecheck was outstanding, and they were playing the body at every opportunity. That led to turnovers, which led to shots on goal, which led to a powerplay goal by Joe Lappin before the game was four minutes old. The Stars had all the momentum on their side. Towards the end of the first period, however, I noticed that the Storm started to get their legs and were playing more aggressive. They were punched in the mouth early and responded by creeping back into the game. That would be the exact opposite of what the Stars would do in the second period when they were faced with adversity. Lincoln took at 1-0 lead into the first intermission. Shots were 12-9 in favor of Tri-City, with the majority of those 12 TC shots coming in the latter half of the first period. In the second period, the wheels came off for the Stars. Completely off. The Storm outshot the Stars 21-3 in the middle period and outscored them 3-0 to take complete control of the game. I mentioned above that the Storm responded in a good way after they were punched in the mouth. In the second period, the Stars simply rolled over and played dead after they were punched in the mouth. No energy. No focus. No fight. That second period was really all that the Storm needed to kill the resolve of the Stars. Tri-City played keep-away from Lincoln in the third period to end this game mercifully, 3-1. Lincoln didn't show up for the third period either as they were outshot 17-4. Considering that the Storm outshot the Stars 50-16 in this game, it's remarkable that the score was only 3-1. All credit goes to Lincoln goaltender Cam Hackett for keeping this game from really getting out of hand. Without his efforts, this is probably a 8-1 or 10-1 loss. It seems like I've been writing the same thing all season long about Lincoln's goaltenders. They don't get any help and have to stand on their heads just to keep their teams from getting blown out. Seriously, how do you get outshot 50-16 at home? In all of my hockey watching at the IceBox, which goes back to the very beginning in 1996, I don't think I've ever seen a Stars team outshot that bad. It was embarrassing. If there was one positive from this game it was Lincoln's penalty kill unit which performed pretty well, considering they were going against the top powerplay team in the USHL. The Storm were held without a PP goal in five opportunities, which included a five-minute man advantage after Stars defenseman Dylan Woolf was given a five-minute major for high-sticking in the 2nd period. Your goaltender has to be your best penalty killer, and Hackett was certainly that. Out-worked, and out-coached. Storm made the adjustments in this game, and the Stars never did. That's the story of this disappointing loss. It was another second period collapse by the Stars which helped propel Bloomington to an easy 5-2 win Saturday night at the IceBox. I didn't attend this game, but I did catch the replay on FASTHockey this morning. It was a somewhat similar start to Friday evening as the Stars looked pretty decent in the first twenty minutes against Bloomington before it fell apart. Once again, Lincoln got out to an early 1-0 lead thanks to Biagio Lerario's powerplay goal at the 2:48 mark of the first period. Much like the Storm did on Friday night, it appeared that the Thunder responded positively after going down one goal early. Instead of rolling over on their backs at the first sign of adversity, the Thunder pushed back and were rewarded with a goal very late in the first period to knot the game at 1-1. Bloomy's goal with only 21 seconds remaining in the first period was a killer. It flipped momentum on their side which they used to bury the Stars in the following period. The Thunder outscored the Stars 4-0 in the second period to take a commanding 5-1 lead going into the third period. Although it may not have been as ugly as the second period Friday night against Tri-City, this one still wasn't pretty. Two of Bloomington's four second period goals came on the powerplay. After the fourth Thunder goal, Stars goaltender Cam Hackett was pulled and Peyton Jones entered the game. Jones' only goal against came with 5 seconds remaining in the second period to make it 5-1, Bloomington. Shots were 13-9 in favor of the Thunder in the second period. Lincoln seemed to play with a little more energy in the third, but the damage had already been done. The only goal of the third period came from Lincoln forward Joe Lappin at the 14:09 mark. Lappin has scored a goal in three straight games for the Stars. As I said on Twitter last night, the second period was Lincoln's kryptonite this past weekend. In the two losses, the Stars were outscored 9-0 and outshot 34-12 in the second period. It all goes back to consistency. The Stars have struggled mightily this season with putting 60 minutes of quality hockey together. Now, we have seen flashes of it. I've seen this team put 60 minutes together against the top team in the western conference (Sioux City) and beat them. However, these last few weeks the Stars have regressed. In their last 11 games, Lincoln has a record of 2-8-1, and those two wins came after regulation. In fact, the last game the Stars won in regulation was back on January 3rd against Madison (a 3-2 win). In their last 11 games, the Stars have averaged 1.8 goals scored, and 3.4 goals against. Although this is not a playoff team, I really hope the fans don't give up on these kids. I know a lot of fans are frustrated right now, but I'm sure the players are just as upset also. They didn't come here to lose hockey games. Back in 2009-10 when the Stars had the worst team in the USHL, the Stars still led the league in attendance. This fan base isn't fickle and will support the players win or lose. I know it's hard to think positive after what we've seen these past couple of weeks, but as a fan base we gotta keep the faith that the people in charge will do what's necessary to turn this thing around. Last night was beyond embarrassing, it was a joke honestly. Someone posted earlier about the problem starting at the top with the new owner making bad hires of a inexperienced GM and coach, and they couldn't be more right. I haven't seen one thing that makes me think things will get any better with who is in charge. I will always hope for the best for the kids who leave home, live in our town and do their best to make it in a game they love, but I just can't support the organization any longer. Does this new coach have any clue what he is doing? After the game on Friday he sounded lost on the radio. Like he had no idea what just happened to his team. Then on Saturday he doens't even show up to talk to Mike Melbye. I'm sure the company that sponsors the postgame comments appreciate his frequent no shows this season. Never thought I would say this but bring back Jimmy. At least the kids wanted to play for him. Not sure if Hartsburg is lost or just out of answers, either way it's not a good situation and seems that we all keep saying the same things in hopes the figure this out, but something has to change in order for this to turn around. I hope for the sake of the players and coaches they figure something out, if not for this season, but to try and lay a foundation for a better year next year. Just got back from "bowling with the Lincoln Stars" and had an absolute blast. If you've never attended this event, you really don't know what you're missing. It's a great opportunity to interact with these kids and see what they're really like. I know how frustrated/disappointed fans are in our play this year, but I would respectfully suggest that the blame lies more with management/coaching than with the players. These are the players YOU wanted, YOU drafted, and YOU ended up with. This team makes alot of mistakes--they seem to be be very hesitant/unsure of themselves mush of the time which leads to turnovers and often disastrous results. players are more concerned with not making a mistake than they are with playing aggressive hockey. to me, this is a COACHING issue. I'm not saying Hartsburg is a bad coach or Hull is a bad manager-but I DO think they need to step up THEIR game. Who's getting paid here? players or management? This Hackett kid must bleed Lincoln Star blue. He has been hung out to dry all season. If you can believe it, a guy in my section was yelling at him to shape up and stop letting TriCity score. That is pretty funny, if they think the goaltending is the issue...I think the numbers on shots allowed, etc from a previous post show that is clearly not the case. I hope you put that fan in his place. Anyone yelling at the goalies this season needs to get a clue or go watch a different sport. It isn't Hartsburg. Hope the owner figures that out.